Prestige really does live up to its name by suppling and fitting a mammoth curved stairlift for this wonderful Victorian staircase located in London. The install involved running tracks over 6 staircases to reach the first and second level floors. Typically, this high ceiling London house has all the original staircase features synonymous with town houses. Owners were keen the staircase banisters and rails would not be damaged. True to their word, Prestige Stairlifts installed the entire curved stairlift with rails without a blemish on this splendid London staircase. The success of this job is due to the expertise and experience Prestige Stairlifts have in their team of professional engineers. In surveying this London staircase, precise measurements were taken to allow bespoke curved rails that were tailor-made to fit every contour. 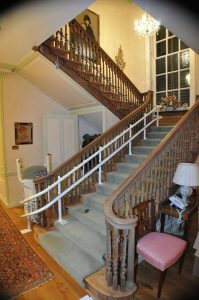 As you can see from the picture, the seat neatly curves around the newel post and tucks out of the way leaving the staircase looking as impressive as ever.